A thank you to Paul Cardall for posting this picture on his blog. I had to share it... no words are really necessary. That is one I would hang in my daughters room!! Love it. You all are always in our prayers. You are truly an amazing family. Tell Gabriella Ris & her mommy said hi. Best wishes & prayers to you. We miss you! I'm LDS, and since Paul Cardall is too, I actually first heard about him from a church, and about his heart story from a newsletter from an LDS bookstore. This is one of my favorite paintings from their store. 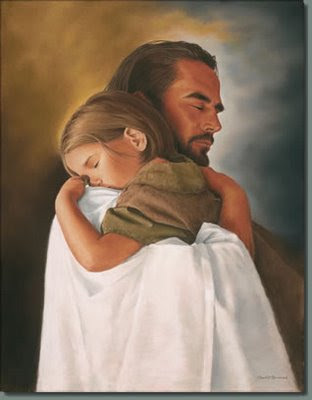 The same artist also has another painting with the Savior holding a little boy who is putting his finger on the Savior's nose. I have that one, but when I went to buy pictures for Lorelei, they were out of this one!